Take English and French out of Canada, and you have a very different-looking country. Data visualizers at The 10 and 3 have done just that, producing an interactive mapthat shows which tongues are spoken most often at home besides the country's official languages. They came up with the map by separating the country into "census divisions." They then discerned a language's popularity by looking at the number of people who speak it at home within those regions. 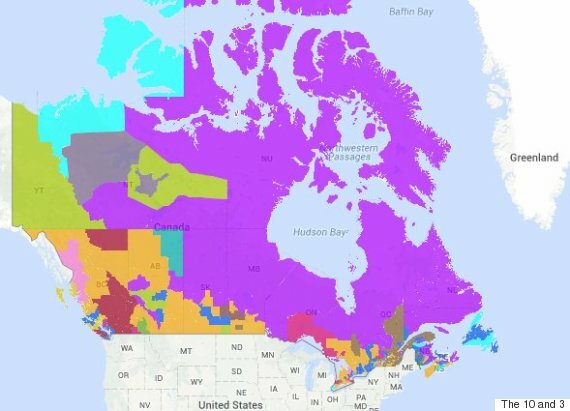 For much of the country, the tongue most spoken at home is any number of traditional indigenous languages, such as Inuktitut, Cree, Dene and Ojibway. This is particularly true in regions including Nunavut, the Northwest Territories, Manitoba, northern Ontario, Quebec and Labrador. But though you might assume that's the case in vast swaths of northern Canada, what you'll actually find is that Tagalog and Arabic are among the most prominent languages spoken in the home in those parts. The 10 and 3's research found that Arabic's prevalence in parts of the Northwest Territories is only one per cent. But among languages that aren't English or French, it has a prevalence of 32 per cent. Inuvik, N.W.T. is home to a community of Muslims that has proliferated since the early '90s as people sought economic opportunities, The Toronto Star reported. The community has grown enough that a mosque with a 10-metre minaret, dubbed the "little mosque on the tundra," was built there in 2010. It's been called the world's northernmost mosque, though claims have also been made for houses of worship in Siberia and Norway, the Star noted. Tagalog, meanwhile, enjoys a 27 per cent prevalence among non-English and French languages in the Northwest Territories, and 21 per cent in the Yukon. Filipinos form the largest foreign-born population in Canada's north, The Globe and Mail reported last year. People from the island country have moved there in search of jobs that allow them to send money home to a country where the average annual household income is approximately $5,000. Like Inuvik's Muslims, their community has grown significantly, from approximately 630 people in the Yukon to a number that could have tripled by 2014. Whitehorse, Yukon's capital, is home to a Filipino restaurant, store and newspaper.Jocelyn Curteanu, a Filipino woman, serves on its city council. But Canada's north isn't the only place where one finds a heavy concentration of languages beyond the official ones. Yiddish has a 32 per cent prevalence in Quebec's Laurentides region, just outside Montreal, despite having endangered status elsewhere. And German has emerged as a prominent language in northern Alberta, at a prevalence of 56 per cent.